[CONT](VC):All of your “Blaster Blade” on (RC) or (GC) get [Power]+10000/[Shield]+5000. 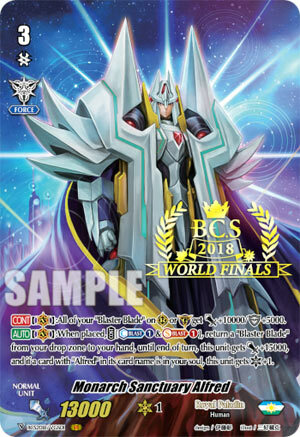 [AUTO](VC):When placed, COST [Counter Blast (1) & Soul Blast (1)], return a “Blaster Blade” from your drop zone to your hand, until end of turn, this unit gets [Power]+15000, and if a card with “Alfred” in its card name is in your soul, this unit gets [Critical]+1. Oh wow, 20k Blaster Blade during the opponent’s turn too. Someone’s not getting attacked…excuse me while I prep my Narukami and Kagero over here. As for the second part of the skill, the only relevant part is the Blaster Blade bit, because by virtue of needing to be a fourth ride to proc fully, he’ll be relegated to Late Game and that’s Perfect Guard territory by then. However, the whole Blaster Blade problem of getting attacked is solved somewhat and at least provides a decent beater as well as an insta-retire if you so choose. I’d say for the most part this either replaced Soul Saver Dragon in an Exculpate deck or is just there to do Soul Saver’s job except a bit worse. I’d choose the Exculpate Build if only for Exculpate himself, because MSA isn’t going to turn too many heads aside from the bling factor.